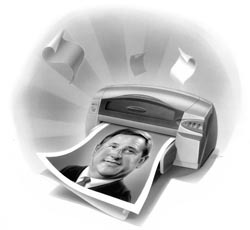 Cover story on Mark Hurd and the profitability of Hewlett Packard…Yawn. As they say on the Dealbreaker message boards, “too printery, didn’t read”. House of Cards story about credit card companies and their exposure to…to…zzzzzzz, oops, fell asleep again! Not much new in Sandra Ward’s article, but worth a read if you have a chronic condition that disables your ability to connect the dots for yourself. Last but not least, don’t forget to take Andrew Bary’s 2009 prediction quiz and submit your answers for a possible prize next January. Winner gets a year sub and either lunch with Bary or $100 bucks…if Abelson is right, that hundred bucks will probably come in handy a year from now.